Windows couldn't be installed. We couldn't update the system reserved partition is an error message that you may receive when you try to upgrade Windows. I ran into the issue on a machine running Windows 10 Insider Builds but users experienced the issue in earlier versions of Windows as well. The error seemed to be common on Windows 8.1 systems that users tried to upgrade to Windows 10. The system reserved partition contains boot information for Windows. Microsoft notes that users may receive the error "We couldn't update the system reserved partition" if it does not have enough free space. Users may receive error code 0xc1900104 or error code 0x800f0922 when that is the case. Windows Explorer lists all partitions of the PC. Check the system reserved partition on the affected PC to find out more about it. You may notice that it has a size of 100 Megabytes and that most of the space is not free. The system partition had 15 Megabytes of free space on the Windows 10 PC that threw the error message. Windows updates may fail if the system partition does not have enough free disk space. Windows administrators can correct the issue by freeing up disk space. I managed to free up 15 Megabytes of space by deleting all language files but the language file that I needed and running check disk to truncate the NTFS log. This resolved the Windows couldn't be installed. We couldn't update the system reserved partition. Microsoft recommends deleting data on the system partition to free up disk space to free up 15 Megabyte of space (when upgrading from Windows 8.1 or earlier), or 13 Megabytes of space when upgrading Windows 10 to a new feature update. You cannot just access the data on the system partition and delete the fonts folder as the partition is not mounted to a drive letter and because of a lack of permissions. Note: You may need to display hidden operating system files. See Show hidden files in Windows 8 and 8.1 for instructions. These work for all versions of Windows. Tap on the Windows-key, type diskmgmt.msc and use the Enter-key to start the Disk Management interface. Right-click on the disk that Windows is installed on, e.g., Disk 0, and select properties. Switch to the Volumes tab. 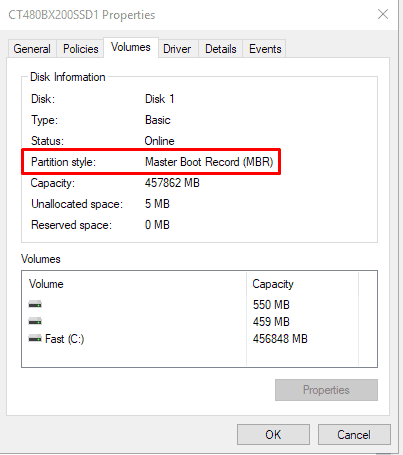 Check the partition style line to find out whether MBR (Master Boot Record) or GPT (GUID Partition Table) is used. Tap on the Windows-key, type cmd.exe, hold down the Ctrl-key and the Shift-key and select the result to open an elevated command prompt. Type mountvol y: /s and hit the Enter-key. This maps the drive letter Y to the system partition. See mountvol documentation here. The /s parameter mounts the system partition. Switch to drive Y by typing y: and press the Enter-key. Type del *. * to delete all font files. Confirm the deletion if prompted. Tap on the Windows-key, type diskmgmt.msc and select the result to load the Disk Management interface. Right-click on the partition marked System Reserve and select "Change Drive Letter and Paths". Select Add in the window that opens. Pick the drive letter Y and click ok.
Open an elevated command prompt: tap on the Windows-key, type cmd.exe, right-click on the result and select "run as administrator". Use cd Boot\Fonts to switch to the fonts directory. Type takeown /d y /r /f . to take ownership. Type icacls Y:\* /save %systemdrive%\NTFSp.txt /c /t to back up the permission to the drive. Type whoami to display your user name. Type del *. * to delete all fonts and press Y when you are asked to confirm the operation. Once done, type icacls Y:\ /restore %systemdrive%\NTFSp.txt /c /t to restore the permissions. Go back to Disk Management and hit the Refresh button to reload the data. You should see that the system reserved partition has more free space now. Right-click on the system reserved partition. Select Change drive letter and paths. Select the Y: drive letter. Select Remove and click ok.
Open an elevated command prompt. Tap on the Windows-key, type cmd.exe, right-click on the result and select "run as administrator". Type mountvol y: /s to mount the system partition. Type explorer.exe to restart Explorer with elevated privileges. Remove all language folders but the folder of the language you want to be used, e.g. en-US for US English, de-DE for German and so on. Remove font files at Y:\EFI\Microsoft\Boot\Fonts to free up more space. Reboot the device. This removes the driver letter. Assign a drive letter to the system reserve partition. Use the instructions from Step 2: Windows 10 MBR partitions to do so. Run the command takeown /d y /r /f . Type whoami to display your username. Open the Boot folder of the system reserved partition (drive letter Y) in Explorer. Remove all language folders but the folders of the languages that you want to use. Run icacls . /grant system:f /t to adjust the ACL back to System. Run icacls Y: /setowner “SYSTEM” /t /c to set the owner of the drive to System. Remove the drive letter in Disk Management. Note: You need to have an external drive with at least 250 Megabyte of space. Verify the drive letter of the external drive in Explorer, we use F: but your drive letter may be different. Type C:\Windows\System32\Reagentc /SetREImage /Path Y:\Recovery\WindowsRE /Target C:\Windows. Remove the drive letter from the system reserved partition. Now You: Did you run into upgrade issues lately? Windows couldn't be installed. 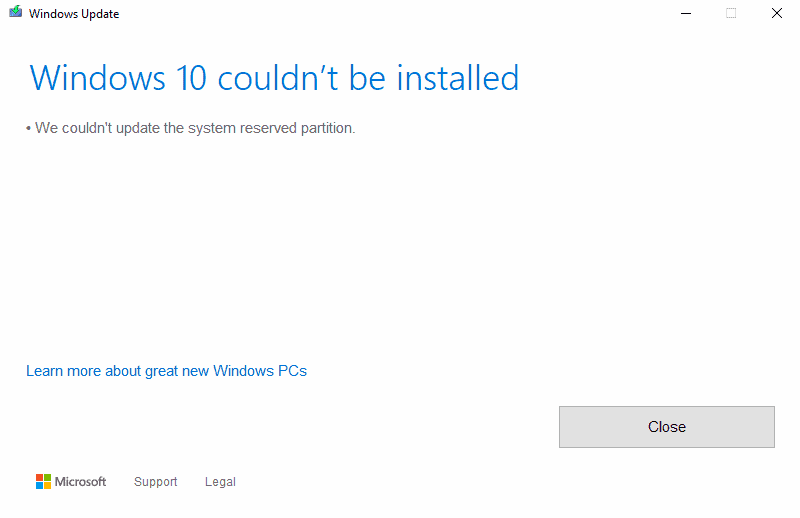 We couldn't update the system reserved partition is an error message that you may receive when you try to upgrade Windows. Use our instructions to fix the issue on your Windows PC. I never allowed Windows to create that system hidden partition. It makes things easier when it comes to backup/imaging. And to do that just create the partition/s prior to installing Windows with GParted without leaving any unallocated space. The main drive on all my systems has the same partition scheme: 64GB (65 536MiB) for Windows and the rest for storage. Using an exact size makes things easier when it comes to imaging one partition and restoring it to another PC, at least when using Windows’ built in imaging tool. Thank you sooooooo much mate, it finally works!!!!!! It worked! Thanks so much! You guys are great, I tried everything prior to finding this post to no avail, soon as I did what you suggested above it worked perfectly, thanks very much for your help! The system I have does not have an SRP. How do I get the update iinstalled?